Nearest Propane: Could not determine. Perhaps Silverton. Sitting in my chair in the brisk early morning air, the warmth of the day’s early sun on my face, I see what you see in the photo of Little Molas Lake at Sunrise. At something like 11,000′ elevation the nights and mornings here are brisk, but when the sun comes up things warm rapidly. It’s soon warmer outside than inside my RV. The air this morning in late June, like most all mornings here in the Rocky Mountains I imagine, is fresh and refreshing. It’s clear and clean and brisk. It just makes you want to take a deep breath and savor it, and I do. In the campsite to my left, or right I suppose depending upon which way you face, is a young couple from Seattle, Eric and Karley. 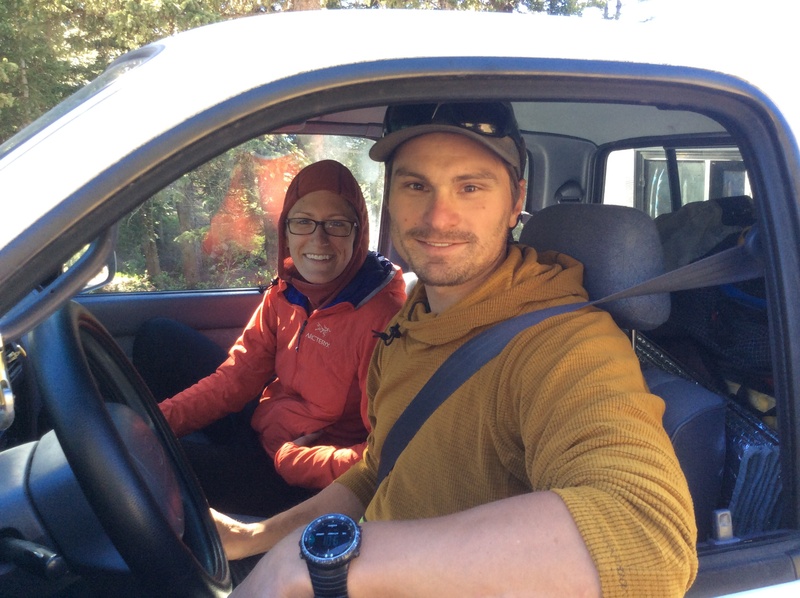 They are on a 3 1/2month adventure, traveling in a pickup truck with a camper shell, climbing mountains as they make a loop from Seattle through Montana and Wyoming, now Colorado, then on to the eastern slope of the Sierra Nevada mountains in California as they travel north back toward home. Eric is studying to be a psychologist. Karley works for a clothing manufacturer. On my other side, a woman traveling solo, Kathy if I recall correctly, who has had something to do with the Colorado trail which runs from Durango in the South to Denver in the north passing right by us here at Little Lake Molas as it snakes its way through the Rocky Mountains. Jean-Jacque, a gent in his 70s resides a few campsites away. He is here helping to lay out the course of a 100 mile foot race which will be run in the area soon and in which he used to participate himself before arthritis and age asked him to slow down. Sharing my campsite is a doctor named Phil who just finished a different 100 mile foot race in the area, and his two friends Susan, a therapist and her husband John who are training for the race for which Jean-Jacque is helping to mark the course. Perhaps I should say I am sharing their space because when I rolled into the Little Lake Molas campground it was full. Noticing Phil outside his trailer I asked if he was leaving to which he replied he had just arrived but that I was welcome to share the site. A little while later Phil realized that I had let him pass me on a steep hill along 550 on the way here and had I not done so it would have been him asking me if I was rolling out rather than the other way around. The campground map posted at the entrance shows only 5 campsites but it also shows 8 fire grates. It also shows 5 camp spurs. I’m uncertain what that’s supposed to mean, but the way things are here right now there are maybe 8 or 10 campsites occupied, about half by tent campers, some marked on the map, some not. Besides the spot I’m sharing which is most likely intended for one RV, there is another, also gravel, which is large enough for perhaps a 40′ RV, one more which is a double wide site which can probably accommodate two large RVs. Then there is a spur area which may be able to accommodate one big rig or a couple smaller ones, or several automobiles. Some spots can handle smaller rigs such as pickups or small trailers. Camping at this Forest Service campground is free, with a 14 day stay limit. There are pit toilets, but no water, no electricity; no hookups of any kind. It’s dry camping. Access is via a mile of dirt road which as of this writing is in pretty good condition and should be passable by pretty much any vehicle. The turnoff onto the dirt road leading to Little Lake Molas campground from route 550 is 6 miles south of Silverton and a half mile or so, I’m guessing, north of Molas Pass. It might be worth a phone call to the Forest Service for more info about this campground. The nearest office is in Silverton: 1468 Greene Street P.O. Box 709 Silverton, CO Phone: (970) 387-5530 FAX: (970) 387-9870. Little Molas Lake is stocked with Golden Cutthroat trout, a beautiful fish, and I assume good eating, but the few fisherman I’ve spoken with in the past few days haven’t had much luck hooking any of them. Cell service is spotty here. Sometimes my AT&T iPhone 5s indicates no service while at other times I have 2 or 3 bars of 4G. My Verizon iPad usually has at least a 3G connection. My Wilson Mobile4G cellular booster usually adds a bar or two or enables my iPad to pull down an LTE signal. A minute ago I had no bars, 4G on my iPhone and could not get email or a web page even with the cell booster on. I restarted my phone and now have 3 bars of 4G with a 1.95 Mbps download speed, .41 Mbps upload and can send /receive mail and surf the web, even stream video. I have a 17Mbps download speed with 2Mbps upload on a 2 bar LTE connection on the iPad with my cell booster on and this is pretty much fast enough for anything and faster than my DSL connection at home by a factor of 3. I’ve been on two hikes in the area. One on the Colorado trail which runs from Durango to Denver and passes by this campground. I followed the trail in a westerly direction from the day use parking area and jumped off of it to climb part way up a little mountain nearby. The views were spectacular and the wildflowers near the top were just out of control! 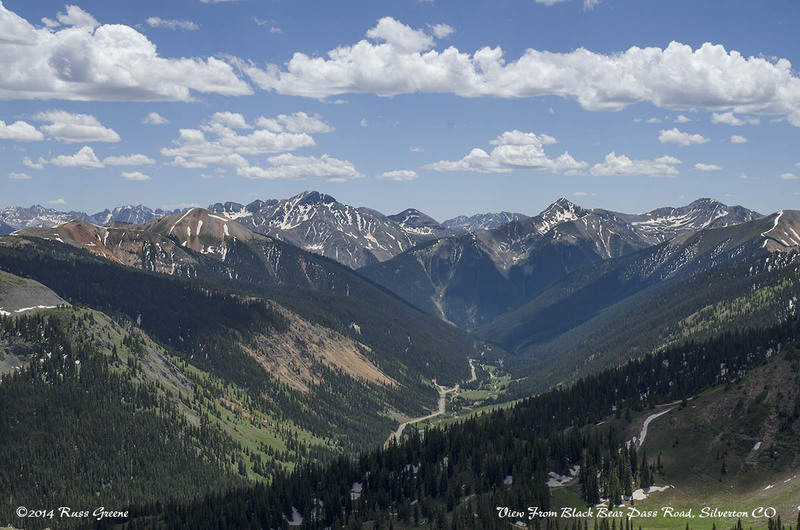 Another hike was up a 4WD road, the Black Bear Pass road which I picked up along 550 a little way north of Silverton by Red Mountain Pass. I shared to road with several 4WD vehicles, ATVs, and motorcycles, but they were infrequent. It’s an uphill slog all the way but the views afforded are nothing short of spectacular. Hi! I know this may be a prying question, but do you travel and blog for a living? How do you make that into a living if so? I would be VERY excited to do this too, and I know more and more people are using a blog to make a living. Do you do this as well, and if so, how do you turn your blog into something you can use to live off of? Thanks so much! No, I don’t travel or blog for a living. Other people have written about what you can expect as a blogger. The reality is precious little. I’m not privy to exact figures but I expect that some bloggers who work really hard at developing and marketing their blogs may earn a little mad money after working at it for a long time. I’ve had tens of thousands of visitors and have yet to receive a penny from the Amazon Affiliate program. That’s just my take on things as someone who hasn’t really been focused upon or concerned himself with maximizing profitability. Let me point you to what I regard as one of the best RV blogs out there: wheelingit.us. Nina has blogged about blogging and if you Google around you’ll find lots of info about traveling and writing. Of course, you could blog with a different bent than RVing and/or sell your writing via a different media, travel magazines or websites for example. If you already write for a living your existing contacts may have some ideas. Hi russ,, when did u made this trip? Im going to colorado this may and im worried there will be a lot of snow still on this area,, i loved your pictures,,i want to see it for myself.. I was gonna go to garden of thw gods but when i saw your pics im kinda confuse where to go now. Also the fact that is free and primitive excites me. I was in Colorado the summer of 2014. 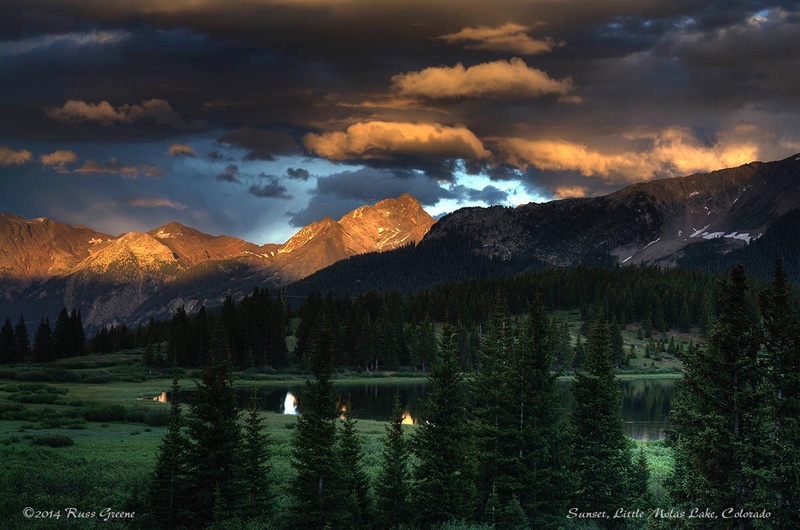 I stayed at Little Molas Lake for 2 weeks with the July 4th holiday falling sometime between my arrival and departure. 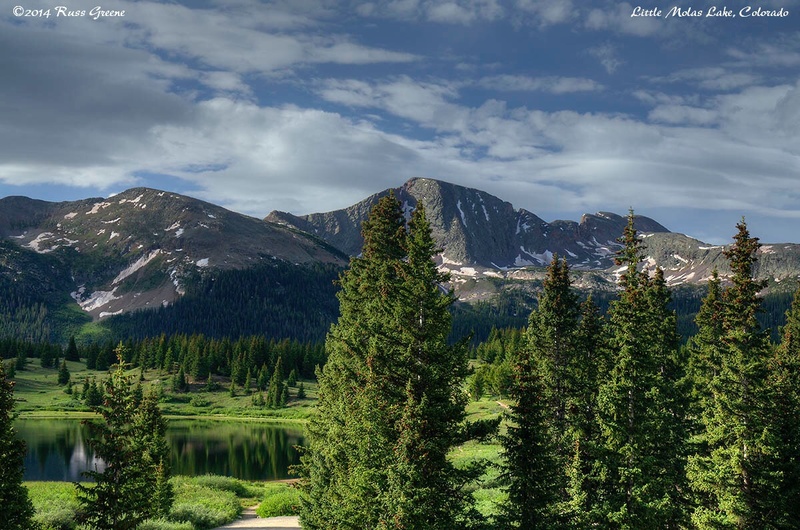 If the Rockies near Silverton are anything like the Sierras in CA, and I expect they are very similar, then there may well be snow at Little Molas Lake in May and perhaps well beyond. 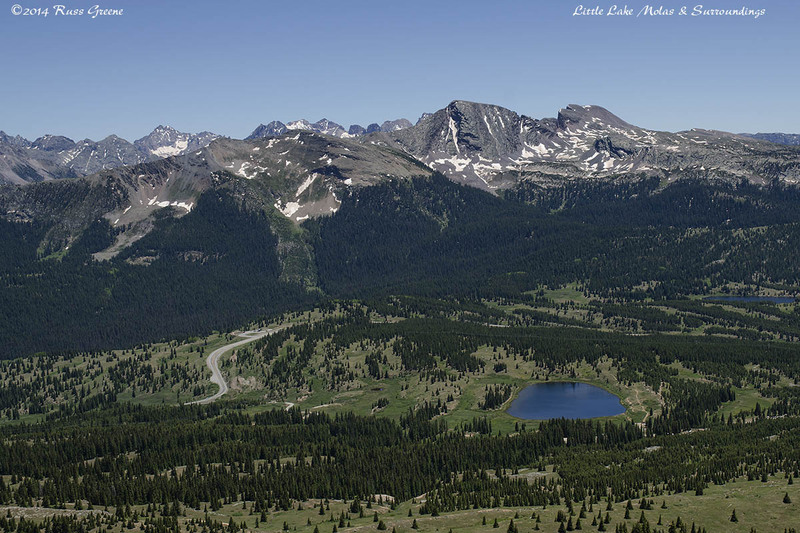 Molas Pass is at 10,900′! Here in CA there can be a wide variation from year to year as to when any given area may clear of snow and I expect it’s the same in CO. I think your best bet for current conditions, predictions and general info would be to contact the Forest Service or the Silverton Visitor Center, 970-387-5654, 800-752-4494. 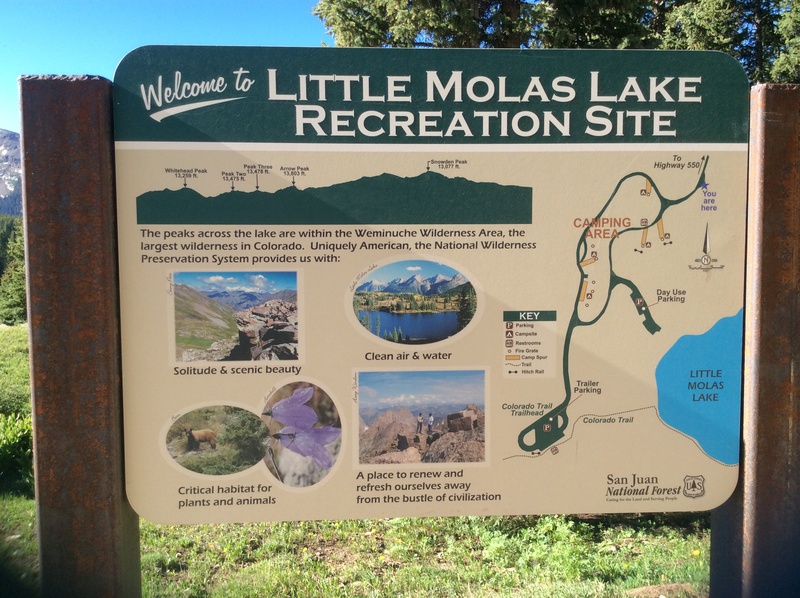 As I recall the USFS shared an office with the BLM right in Silverton, about 6 miles from Little Molas Lake. I tried to find contact info for you but was unsuccessful. I’m sure with a little perseverance you’ll be able to locate someone knowledgeable. Colorado Springs near Garden of the Gods is up at 6,000′. I’d get snow reports for there too before heading up that way. Have fun and let me know where you go!